Pandan leaf is a very versatile ingredient in making many desserts and cakes, like pandan dumplings and pandan chiffon cake. The dish won’t taste or smell as good without it. Wonder if you tried pandan rice. 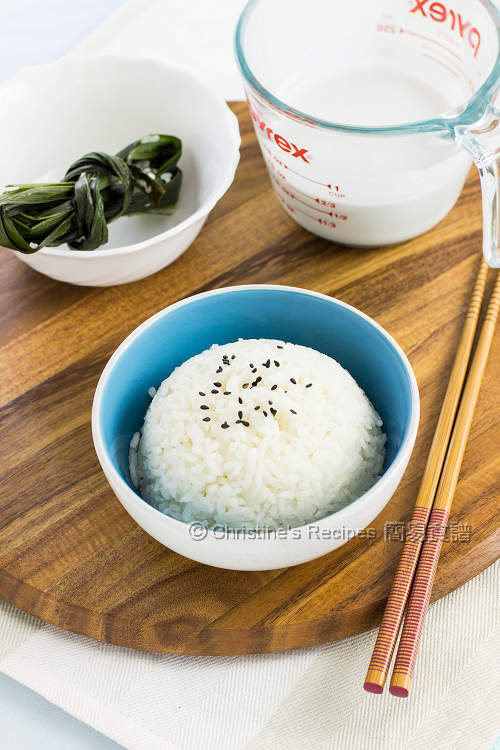 This rice is totally infused with a depth of pandan and coconut fragrance. When I had the rice, I suddenly realized why my readers from Singapore and Malaysia are so deeply in love with pandan. Give it a try if you haven’t had it before. 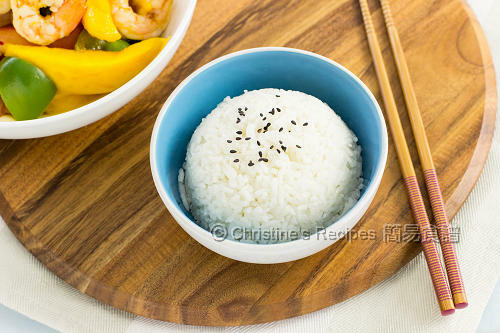 The dinner for the other night was a simple dish, stir fried prawns with mango going with this fragrant and tasty rice. Rinse the rice and drain well. Rinse the pandan leaves and wipe dry. Tie them together into a knob. Set aside. Put the rice into a heavy based pot. Pour in the coconut milk and water. Stir in salt. Remember to level the rice. Put in the pandan leaves. Cook with a lid over high heat. Once it boils, reduce heat to medium low. Continue to cook for 20 minutes. When the rice starts to dry up, you’ll see less steam releasing from the lid. Don’t remove the lid. Turn off the heat and let the rice sit for about 10 minutes. Done. Serve hot. If using a rice cooker, the proportion will be 1:2. Be aware that the water absorption of every kind of rice is quite different. Please adjust accordingly. Remember to keep rice in the pot with cover for further 10 minutes after turning off the heat. 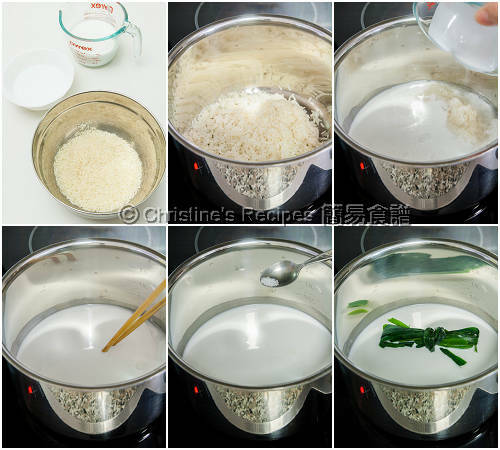 It helps the rice absorb more moisture and keep soft and fluffy. 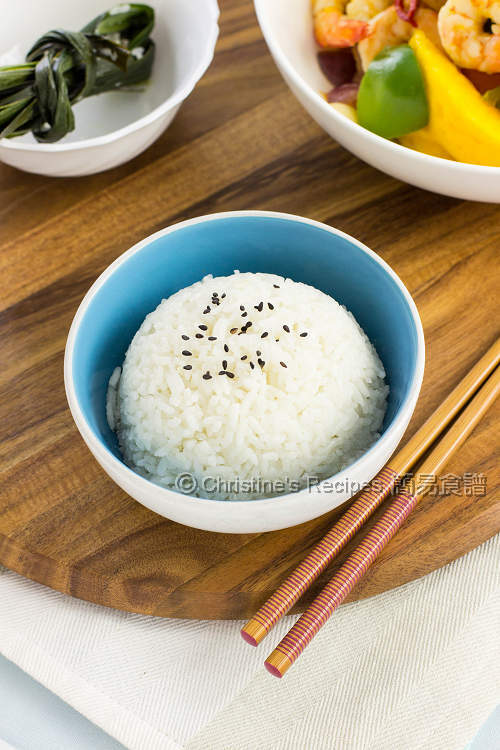 The rice must be extremely aromatic and delicious! I cooked this pandan coconut rice today and I agree with you, it's awesome with sambal belacan, fried fish and eggs. Great combinations, Kimmy. I love sambal belacan indeed.